Charlotte Marshall, who taught Bhutanese refugees last year, reports on the global diaspora caused by the ethnic cleansing that took place in the country in the 1980s and 1990s. Charlotte is studying an MPhil in Development Studies at Cambridge University. 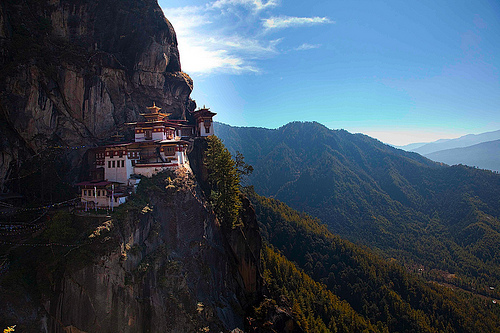 Bhutan, a nation nestled high in the Himalayas, universally revered for its breath-taking natural beauty and well-preserved traditional values; most significantly it is famous for being the only country in the world to measure ‘Gross National Happiness’. Until recently, I, like many others, knew only the Bhutan in the glowing news reports on its glamorous royals and the glossy tourist brochures filled with silky pictures of magnificent landscapes. It was last September that I first learnt of a very different side to the nation. I, and a group of other students at the University of Manchester, established a project alongside the charity Refugee Action, in which we taught English to Bhutanese refugees newly arrived in Greater Manchester as part of the government’s Gateway Protection Programme. The programme is an international resettlement programme run by the UN’s refugee agency, in which around 30 countries participate. Since 2004, the Home office has accepted up to 750 refugees a year under the scheme. Those that attended the sessions were all ethnic-Nepali or Lhotshampas, the ethnic group persecuted by the Bhutanese government in the early 1990s. The more English they learnt the more I and the other volunteers ascertained about the circumstances that forced them to leave Bhutan. Their stories compelled me to undertake further research into the situation. According to the UNHCR, as of 2011 more than 77,000 Bhutanese refugees are living in refugee camps in Nepal. Thankfully, there has also been hope for a better life for the refugees in the form of resettlement programmes, like the Gateway Programme, in a number of host nations. More than 43,500 of the Bhutanese refugees have been resettled in a handful of countries including the United Kingdom. Undoubtedly, this resettlement has vastly improved their lives, and indeed, the Bhutanese I taught felt accepted in the Manchester area and happy with the opportunities available to them. Yet many, particularly the older generation expressed their primary desire had been to return to their homeland. Bill Frelik suggests that this is a common theme, particularly among the older refugees, noting how, ‘about 17,000 of the remaining refugees have not sought third country resettlement, many still holding out for repatriation’. Yet there is little hope that repatriation will become an option in the near future. The ethnic cleansing in Bhutan largely escaped the prying eyes of the world’s press, and as we enter 2012, the events of the 1990s continue to fade into distant memory. The Bhutanese government has persistently denied responsibility and in July 2010, Prime Minister Jigme Y Thinley described the refugees as illegal immigrants. Thousands of refugees continue to languish in camps in Nepal and as of yet, not a single person expelled in the 1990s has been allowed to return. Some of the children whom I taught at the weekend classes had been born in the refugee camps in Nepal. They have sadly never seen, and most likely will never see their parent’s home country. The time has come for those host nations, coupled with the UNHCR, to push for the Bhutanese government to take responsibility for its actions. Until then, the unrelenting discrimination in Bhutan continues to slip beneath the radar in the international media, and the attitude of the Bhutanese government does not waiver.